An EastEnders Christmas that will go down in history. It’s a Christmas tradition: gather round the telly, belly full of turkey, and watch the EastEnders Christmas special. It’s a sombre reminder that, no matter how annoying your great aunt is being, there are people worse off in the world. Across thirty years of Christmas specials, we’ve been treated to divorce papers, weddings, fires, heart attacks, paternity bombshells, and of course, the obligatory knees up at the local pub. Ah, the Queen Vic – with its murderous bust, bodies in the cellar and dangerous rooftop terrace, where better to spend Christmas? But with drama flying thick and fast over the festive season, it’s often hit and miss for EastEnders, and with high stakes at play too. Get this one episode right and millions could be tuning in for the year to come, hooked before the humdrum of a busy life takes over. Last year’s outing failed to appeal – Phil’s liver transplant, Max’s understated return and the locals happy (?!) at the pub went down like a damp squib. 2017 so far has been similarly bad received, with storylines ranging from boring (the bins!) to ridiculous (Steven’s fake brain tumour!). Just when all seemed lost, a Christmas angel appeared in the form of returning executive producer John Yorke, bringing with him the promise of EastEnders‘ most shocking special yet – the destruction of the Branning family. While Max’s (Jake Wood) revenge storyline has encountered criticism for its slow-pandering nature, its explosive unravelling this December has been brilliant. Wood’s unhinged portrayal of a once-loved character is enamouring, with our feelings for Max as complex as his mental wellbeing. His reignited passion with Stacey (Lacey Turner) on Christmas Eve might have seemed a little implausible considering Stacey’s loving husband Martin (James Bye), but their on-screen chemistry – twelve years in the making – is a joy to watch. It’s an ingenious move from Yorke and returning writer Simon Ashdown to parallel the Branning’s original Christmas back in 2007, when Max and Stacey’s affair was exposed to their families. We were always expecting the spectres of that iconic special to loom over this year’s episode, but the unannounced return of Jo Joyner was the icing on the Christmas cake. Watching Tanya march back onto the Square to right some wrongs had everyone cheering, and it wouldn’t be a Branning Christmas without their original matriarch. In just half an hour she was dropping bombs across Walford, demanding daughters Lauren (Jacqueline Jossa) and Abi (Lorna Fitzgerald) leave town with her, revealing that Max murdered Steven earlier in the year, and exposing Max and Stacey’s latest tryst to the shocked Fowlers. 2007, eat your heart out. EastEnders is at its best when remembering and honouring its past, and Ashdown nails the nostalgia across this hour of impeccably written drama. The complex, brilliant history of the Brannings is paid homage to throughout, perhaps most subtly in the episode’s closing shot – the horrified expressions of Tanya, Stacey and Max, mirroring the end of Christmas 2007. And, of course, events had to come to a head atop the Queen Vic roof, the place poor Bradley met his maker eight years earlier. 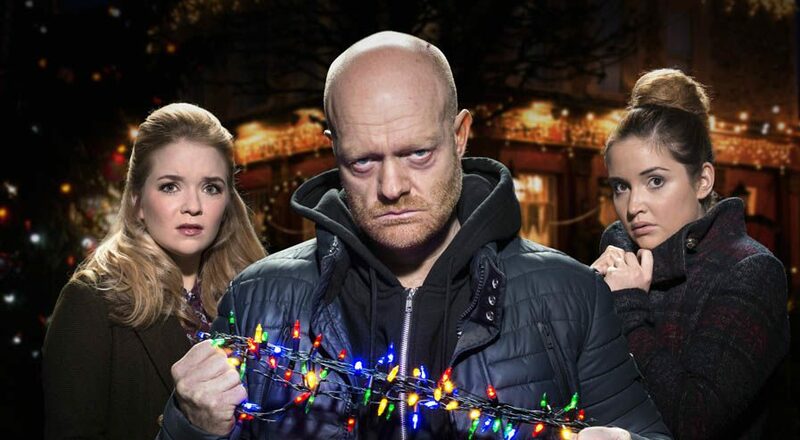 The fall of Lauren and Abi Branning will have millions hooked for episodes to come, a sign that Yorke has delivered a Christmas to be applauded. One question remains: will someone put a lock on the Vic roof?! EastEnders continues tonight (Boxing Day) at 7.30pm.